A growing part of society increasingly looks for trust and individuality in their consumption. Two elements that many consumers miss in the mass market. The concept of “prosumers”, driven by civil society initiatives such as urban community gardens, foodsharing or repair cafes, offers the opportunity for participation and empowerment of consumers, who become prosumers: contributors to the Sustainable Development Goals. This report provides recommendations for actions to promote the development and implementation of sustainable prosumption models. 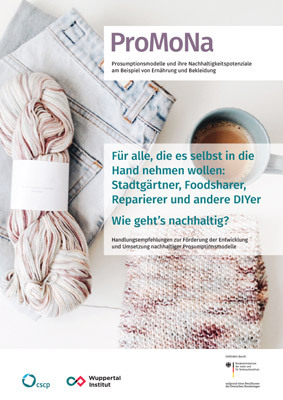 It is based on the project “ProMoNa”, where we took a closer look at the sustainability potential of prosumption – whether it’s about consumers landing a hand in the production of their own food or repairing their favorite jeans. The report is aimed directly at prosumers and those who want to be and provides helpful recommendations for the practice in the fields of nutrition and clothing.